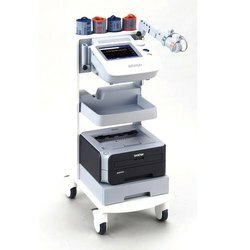 This innovative products is from Omron Healthcare, Japan and imported to India by Omron Healthcare India. We are their authorized distributor in India for selling across the country. If you are interested to see a demo please do contact us. VP1000 Plus Non Invasive Vascular Screening Device is manufactured by Omron Healthcare, Japan and this product is exclusively distributed in India by us for the Indian market. The Vascular Profile VP1000 plus provides the clinical information, which can aid in the early detection and treatment of arterial disease. The VP1000 plus is a powerful screening device for the non-invasive assessment of arteriosclerosis and represents the latest innovation using Colin's patented "Waveform Analysis and Vascular Evaluation", technology. The VP1000 plus assesses arteriosclerosis by PWV (Pulse Wave Velocity : an index of arterial wall stiffness), ABI (Ankle Brachial Index : an index to assess arterial occlusion) and TBI(Toe Brachial Index: an index to assess the severity of the lower limb arterial occlusion). The two indices are obtained using simultaneous blood pressure and waveform measurements on all four limbs along with ECG and phonocardiogram tracings. Simple set-up and short operation time make the VP1000 plus an ideal tool for patient screening and follow-up as such, it provides benefits for a wide variety of clinical applications. Using it's four cuff system the VP-1000plus quickly and simply assesses Ankle-Brachial Index (ABI) and Pulse Wave Velocity (PWV) providing highly valuable clinical information within minutes. The short time taken to complete the assessment and the fully automatic functionality make the VP1000 plus ideal for Vascular clinics, Cardiology, Diabetology and General practice. The VP1000 plus Measurement Process can take as little as 3 minutes to complete from start to finish. The 'Sensor Cuffs' measure arterial pressure and waveform, eliminating the need for hand-held probes, and hence eliminating investigator variability. The VP1000 plus simultaneously measures arterial pressures and waveform in all 4 limbs facilitating a highly accurate Ankle-Brachial Index calculation that isn't compromised by the passing of time between individual limb measurements done sequentially. The Omron VP1000's touch screen interface and logical menu system simplifies data entry and navigation. The VP1000 plus has a memory for 200 patient report in pdf and 2000 patients raw data built-in. With an external memory connected the VP1000 plus stores unlimited no of patient’s pdf report. The VP1000 plus plus allows clinicians to select printed report formats that are most appropriate for their practice (Click on Printed Reports to view reports). Reports available include: Clinicians Report, Patient Report, Trend Report, Post Exercise/Recovery Report. The R-R variability test helps to record the coefficient of variation of HRT and helps to interpret the patients with diabetic autonomic neuropathy failure. A simple 2 minute supine resting ECG test provides the data and report. The VP1000 plus plus main unit can operate as a 'Bench Top' unit, separate from the roller stand and printer, and can be transported in a small case making it portable enough to take between clinics or consultation room. The VP1000 plus plus can be networked with major clinical management software packages, allowing simple data storage directly into patient files. Looking for Non-Invasive Vascular Screening Devices ?